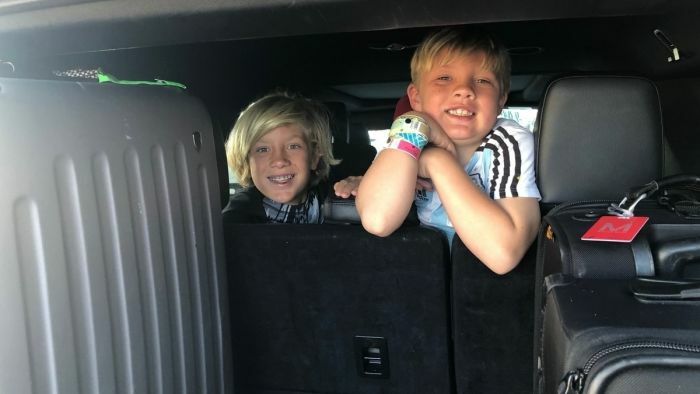 Yes, four adults, a twelve-year-old and a six-year-old can all ride comfortably, with 12 pieces of luggage, in a 2018 Ford Expedition Max! 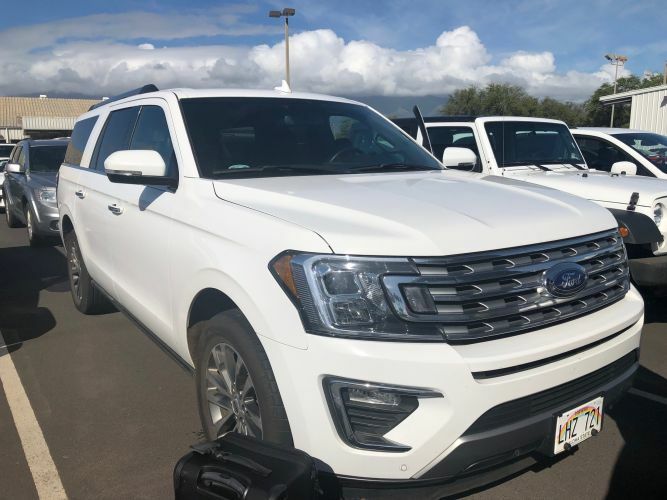 The first thing you notice when you go to the car rental agencies outside the Kahului airport, in Maui, Hawaii, is the disproportionate number of SUVs. Everywhere you look there are sport utility vehicles, most of them are white, to reflect the nearly constant hot sun. I would guess that is because many families were doing what we were, traveling together and staying for about a week.We rented a 2018 Ford Expedition Max, but there were equal numbers of available huge, white, Tahoes, Suburbans, Yukons and Navigators. Traveling to Hawaii seems to make luggage multiply. We made our group pare it down to just two bags per person, including carry-ons. Usually fitting 12 bags, even carry-ons into a vehicle is a Tetris game, but not this time. The back of the 2018 Ford Expedition Max is large, even by SUV numbers. It even had room for us to make our run to a big-box store, before heading to the hotel. Several cases of pop, water, and boxes of chips and snacks fit inside the huge vehicle with no major complaints. And no one had to stack things on their laps. Take it from 12-year-old Tanner, our grandson, who is used to traveling in a previous generation Ford Expedition. Tanner loved the Expedition Max! Tanner says, “What I really liked was how big it was! The seats all the way in the back are really comfortable. It has a lot more leg room in the back than our other Expedition.” More legroom is important to a dedicated soccer player, especially one that is growing taller by the day. The other important thing Tanner noted was that he could feel the air conditioning and it wasn’t stuffy. Many people complain that airflow is bad in the larger sport utes and it is the kids who are last to cool off. Tanner’s brother Cash, at just six-years-old, said he “liked it a lot because it was so big”. It is pretty easy to spot the tourists traveling in their massive rentals while the islanders drive smaller, more fuel-efficient rides. Gas appeared to range between $3.58-$4.00, depending on where you were on the island. Anyone who has traveled with kids is familiar with the “He’s touching me” complaint. But the roomy seats seemed to spare us from the battle. As we headed to our hotel in Wailea, the Max handled beautifully. It navigated the lanes, narrowed by road construction, well. Although it is big, it never seemed too big for the roads or the situation. It was kind of funny at the hotel, it almost seemed like a comedic skit, as six people, 12 bags and loads of food and beverage were emptied from the vehicle. The valet laughed as he loaded up luggage trolleys and then parked the Max next to the line of large SUVs. The 2018 Ford Expedition Max performed great through all of our excursions. It maneuvered well as we checked out the nearby golf courses. It took the 40-minute drive to and from Lahaina in stride. Although the streets in the small city seemed narrow for such a large vehicle and finding an on-street parking space was impossible. I would say the only drawback was finding parking. You pretty much had to valet or opt for paid parking where ever you went, because the SUV was just too long for the tiny island spaces. Even in the paid Lahaina lot, the Max barely fit between the painted lines. Similar trips to Kihei and Paia had similar results, it was easier to give the SUV to a valet or find a parking lot, than spend time trying to find a viable space. The popularity of the redesigned Ford Expedition Max is a big reason that Ford is expanding production of the Expeditions and the Lincoln Navigators. Ford announced last week that it is increasing production of the vehicles by 20 percent this summer to meet the strong demand. Ford is adding 550 jobs at the Kentucky Truck Plant, in Louisville, and supposedly reconfiguring the assembly lines to increase the production more efficiently. Expedition sales really took off with the redesigned version, growing 35 percent in 2018. The new Expeditions are more expensive but people appear to be willing to pay it. According to Ford, the average transaction price grew by $11,700. Ford says the average 2018 Expedition sale is now $62,700. Navigator sales also boomed, up 70 percent in 2018. Ford says that the new Expedition has class-leading interior space and legroom, something that Tanner certainly noticed. The Expedition now seats eight and even adults can sit in the way-back and not feel claustrophobic. Driving the Expedition Max helped make our island trip maximum fun!